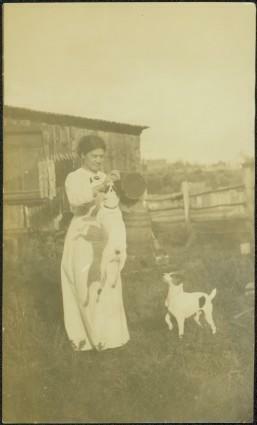 Young woman believed to be Sarah Glassey stands in farm yard with two small dogs. One is hanging from the air as its teeth grip the dish Sarah holds. Fence and buildings in background. It is also possible that this woman may Violet (nee Taylor) Baxter, niece to Sarah Glassey. Item is part of the Taylor-Baxter Family Photograph Collection. See also items 2009.5.2.205, 2009.5.2.271, & 2009.5.2.272 for images featuring similar content.